Rain starting this evening and breezy tomorrow morning. Maines oldest lobstering village, Cundys Harbor is a small, rugged Down East town with about two hundred permanent residents. The towns main industry is lobstering and fishing and many of the towns residents are working lobstermen. Although fairly small and remote, Cundys Harbor is only a twenty-minute drive to Bath or Brunswick with equally convenient access to the township of Harpswell to the west. Cundy Harbor (the body of water) and Cundys Harbor (the town--note the addition of an s) are located off the New Meadows River north of Cape Small and northeast of Orrs Island. To get an idea geographically, Cundy Harbor is 20 miles northeast of Portland and 13 miles southwest of Bar Harbor. Although there is not much in the way of facilities here (Cundys Harbor is primarily a fishing and lobstermen village), you can generally arrange for a mooring with the Holbrook Store (if space is available). 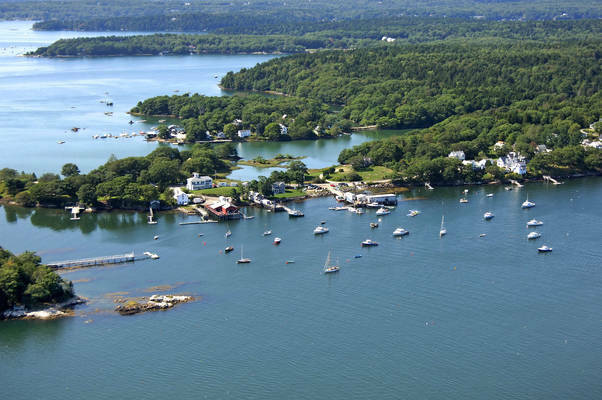 Easy access to prime lobster grounds has kept Cundy Harbor (the town is properly called Cundys Harbor while the harbor itself loses the s) thriving for over five generations. More recently, along with lobstering, tourism has begun to play an increasingly important part in the local economy. The towns relative closeness to Brunswick and Bath has made it a popular stopover for cruisers. Cundy Harbor is approached from the south via a passage through the New Meadows River. To reach Cundy Harbor, first set a course to intercept red nun buoy 2, which is located at the following approximate position west of Jenny Island: N43 45.866 W6954.176. (Make sure you leave red nun buoy 2 well to port heading north; there is a two-foot-deep rock ledge just to its north.) Once you have safely navigated to red nun buoy 2, set and follow a new course of about 070 degrees magnetic for approximately a half-mile to intercept green can buoy 9, which is south of Rogue Island. From green can buoy 9, head north to flashing green buoy 1, which is about seven-tenths of a mile away on an approximate heading of 037 degrees magnetic. Although Cundy Harbor is not particularly well protected (except from the west), the Hollbrooks Store moorings are sturdy and well-placed. Cundys Harbor is mainly a lobstermen village, so make sure you radio ahead for specific availability of overnight moorings before your arrival. A very quiet and small village, most events are not centered in Cundys Harbor itself, but more around Baths and Brunswick to the north. There is a scattering of small Bed and Breakfasts in the village, and local vacation rentals are available during the season. Wiscasset has a general aviation airfield about 20 miles to the northeast of Cundys harbor. The Brunswick area, just north of Cundys Harbor, also has a few small airfields, but none offering commercial service. Those wishing to coordinate a crew exchange requiring major carrier service can use Portland International Jetport, which is about 20 miles (line of sight) to the southwest. Several taxi services operate out of nearby Brunswick. Check the local Yellow Pages or an online directory for phone numbers and hours of operation. No reviews yet! Be the first to write a review of Cundy's Harbor.